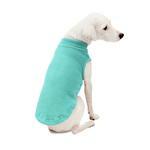 This Stretch Fleece Vest in Mint is perfect for your pup when they are out and about on chilly days! 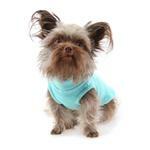 The Mint Stretch Fleece Vest is great for dogs of any size to warm up and be cozy. This mock turtleneck sleeveless vest for dogs features a plush, stretchy fleece that is so comfortable that it can be worn all day. This stretchable material makes this pullover vest easy to put on and take off with a great fit. There are no fasteners to mess with. The high-cut tummy will keep your pup clean and dry. 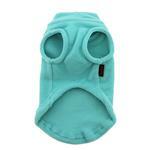 This fleece pullover is ideal for chilly days and for dogs that have trouble staying warm indoors too. Ideal for senior pets, short-haired, and hairless breeds. Even hairless cats will enjoy this cozy pullover. 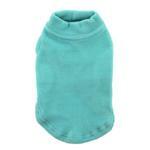 Your pet will love the cozy warmth that this garment offers! Since Gooby dog clothes run small, be sure to measure your pup before picking a size. Care: Polyester/Spandex blend. Machine wash in cold water. Hang to dry. Stretch Fleece Dog Vest by Gooby - Mint Customer Photos - Send us your photo! Buddy is getting ready to show off his new fleece vest to his friends. We have several Gooby vests/jackets, but Buddy loves the mint color the best(It could be that I love mint)! Plus it's stretch & fits him like a glove! Since he is just a little guy, we appreciate the extra warmth to keep Buddy warm during these cold winter days. Charley polished off some "turkey stuffing" while wearing his Mint Fleece Vest on Thanksgiving Day. This is the first fleece style vest we purchased for our mini doxie and first I love this mint color and also It is nice & soft ! The one thing I dont like is I wish it was a little bit longer & it would look better on doxies ! I am very pleased with the stretch fleece vest. Seems just perfect for cold Texas weather. I have purchased several colors. I wish it came in more colors. Posted On 12/06/18 by Terri P from , Yes, Terri P recommends this product! My rat terrier loves this fleece vest! She gets chilly in the winter and this vest keeps her warm. She is always happy when I put it on her. It is stretchy and soft and she seems very comfortable in it. The mint color is very pretty! Posted On 12/05/18 by Jennifer L from Senoia, GA Yes, Jennifer L recommends this product! Perfect for cold days. The fit is perfect and comfy! Posted On 09/29/17 by sherry from , Yes, sherry recommends this product! Fits perfectly. Very warm and great color. Posted On 05/14/17 by Roxann M from Reading, PA Yes, Roxann M recommends this product! 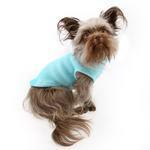 I love this fleece vest for my Chinese Crested!! It fits her so comfortably. I have it in the blue and lavender also. The color looks great on both my tan dog and my cream one. The fit and length are good for warmth and comfort. My dogs wear these for daily play outside and they wash and wear well. I am a regular shopper at Baxterboo. I usually call in my orders; however, I completed my purchase on line this time and it was quick and very easy. Everything about Baxterboo is top notch; I recommend anyone looking for pet items to start here.